A best-selling text rich in case studies that reflects on the unique complexities of marriage, couples, and family counseling. Now updated to reflect the new Ethical Code – An examination of the 2012 Code of Ethics of the American Association for Marriage and Family Therapy. Developed for students, educators, supervisors, and practitioners alike, this text examines the significant classical and contemporary issues in marriage and family therapy. The text opens with a thoughtful discussion of client and therapist worldviews, value sensitive care, the ecology of therapy, and commonalities between personal and professional acculturation. 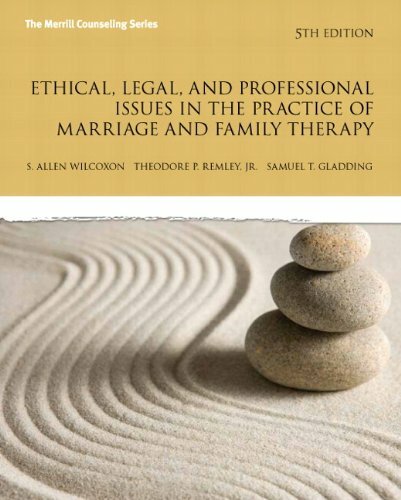 Following the book’s preliminary discussion, the text moves on to consider the legal, ethical, and professional issues that marriage and family therapists face each day as well as the best strategies for navigating these issues. The updated Fifth Edition includes a number of new topics, including multicultural issues reflecting institutional oppression; boundary, competency, and liability concerns associated with technology-based client care; the significance of supervision in both skill acquisition and professional acculturation in one’s early career; nontraditional family care; conflicts between legal and ethical obligations; emerging issues in MFT licensure; and ethical and empirical considerations related to evidence-based care.